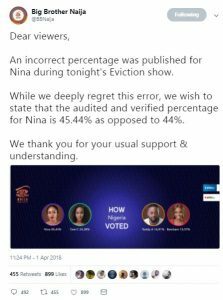 Organizers of the Big Brother Naija 2018 have addressed controversy trailing last night eviction as organizers were forced to apologize for airing a wrong percentage vote for housemate, Nina during the live eviction show. Recall that Nigerians had taken to social media to blast the organizers after noticing an error in the voting results accusing them of altering the eviction votes as Fans noticed that 1. 44 % votes was missing.